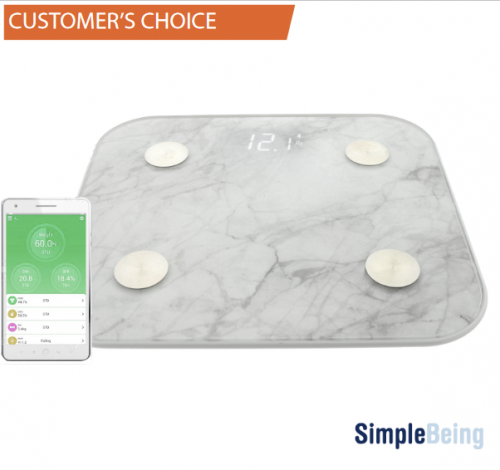 Simple Being is excited to announce the launch of its Bluetooth body fat scale that will help keep people’s weight, body fat and other essential body composition percentages in check. The official launch date for Bluetooth body fat scale is August 14th, 2018. Carlsbad, United States - August 11, 2018 /MarketersMedia/ — Carlsbad, CA – Simple Being is excited to announce the launch of its Bluetooth body fat scale that will help keep people’s weight, body fat and other essential body composition percentages in check. The official launch date for Bluetooth body fat scale is August 14th, 2018. Many recent studies have established that monitoring weight on a daily basis improves weight loss and adoption of weight control behaviors. Additionally, Traci Thompson, Director of PEAK Health & Wellness at the University of Utah, deemed that body composition is one of the best indicators of overall health as it can help determine your risk for cardiovascular disease, diabetes, metabolic disease, osteoporosis, and other diseases. Simple Being believes that they can offer something that can help people regularly check their weight and overall body composition to help them achieve realistic health and fitness goals. The company launches their Bluetooth body fat scale that can almost instantly provide critical data including your weight, body water, body fat percentage, muscle mass, bone mass, BMI, visceral fat, calorie, and body age. “Determining physical fitness has already evolved – it’s not just about losing weight. Fitness specialists can attest that there are other important factors in determining a person’s physical fitness such as body fat percentage, muscle mass, etc. People tend to be concerned only about the number they see on a traditional weighing scale, they often disregard the vital role that muscles, fat, bone, and water play. The number you see when you step on a regular scale really doesn't tell the whole story about how healthy or unhealthy you may be,” said Angela Peet, Online Marketing Officer of Simple Being. Simple Being claims that their Bluetooth body fat scale will help people get a more detailed picture of their general health. They believe that it is highly effective in tracking not just weight, but a person’s overall fitness level. It comes with a downloadable app that is available for devices with iOS or Android version 4.3 and Bluetooth 4.0 or higher system. “Our product is very easy to use. Actually it is designed for home use. No setup is required as it auto calibrates between uses. It has a large LCD, step-on technology for auto switch on and off, plus low battery and overload indicators. Importantly you won’t be needing a Wi-Fi connection to get your body composition metrics. Just connect to your device’s Bluetooth and you’ll receive your stats within seconds of stepping on the scale,” Tim Jenkins added. Simple Being’s Bluetooth body fat scale will be available for sale on Amazon US as well on the company website. The product features impact-resistant tempered glass platform and stainless steel sheet iron to support up to180kg/400lbs. It is also equipped with high precision sensor system and CPU. According to their product page, the company offers a 30-day money-back guarantee and 1-year warranty. For more information about the product you can check out their website at www.simplylifehome.com or their Amazon store.